New Outcome-based Accreditation (OBA) Manual of BAETE for the undergraduate programs will be effective from 1 July 2017. A meeting will be held on 18 April 2017 Tuesday at 6:00 PM in the ERC, 1st Floor, IEB Headquarters, Ramna, Dhaka-1000 to appraise with the new OBA Manual. All Program Directors, Deans of Engineering Faculty, BAETE Program Evaluators and Heads of the Institutions are cordially invited to attend the meeting on time. BAETE provides accreditation to a Program that is offered by an institution of higher learning approved by an appropriate authority, viz., the UGC or any other appropriate government body. The program shall be of a duration of four years, after twelve years of schooling. The program shall include sound foundations in science and mathematics leading to the professional practice of engineering. The program applying for accreditation shall do so from its own obligation. Accreditation is granted only to programs and not to the institution as a whole. The same program offered at different campuses of an institution must be accredited separately at each campus. This website provides comprehensive information about the accreditation criteria, policies and the process followed by BAETE. It also maintains a list of programs that obtained BAETE accreditation and also a list of programs that BAETE is considering for accreditation. A delegation from BAETE, Bangladesh participated as Observer in Accreditation Visit at Nanyang Technological University (NTU) in Singapore during 20-21 March 2018 along with pre-visit and exit meeting. BAETE was represented by Prof. Dr. Sohel Rahman, Chairperson, Sectoral Committee for CSE and Prof. Dr. Salekul Islamn, Member, Taskforce, BAETE. Two experience sharing sessions for program evaluators (EP Training) have been organized by BAETE on 15 February 2018. The program evaluators are divided into two groups: Group-A and Group-B. 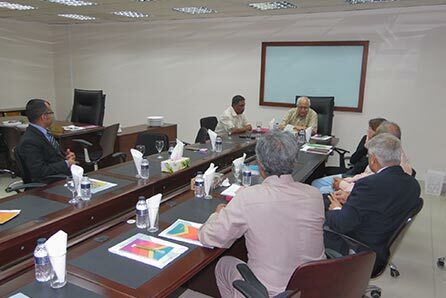 The Board Members, Sectoral Committee Members The Chairpersons of the Visiting/Evaluation Team and Member of the Visiting/Evaluation Team who has already visited multiple programs are invited in Group-A. All other members of the Visiting/Evaluation Team and Panel Evaluators are invited in Group-B. Prof. Dato' Ir. Dr. Wan Hamidon Wan Badaruzzaman and Prof. Ir. Dr. Hjh Siti Hawa Hamzah of Board of Engineers, Malaysia (BEM) visited Bangladesh as Washington Accord Mentors to BAETE during 08–14 December, 2017. Prof. Wan and Prof. Siti attended the meeting with the BAETE Chairman, Board members & Sectoral Committee members; observed an accreditation visit at Stamford University of Bangladesh (SUB) and conducted a workshop on preparation of Outcomes-based Accreditation (OBA) for Faculty and Program Directors of different public and private universities. They also conducted another workshop/sharing session for Program Evaluators of BAETE. Er. Prof. Dr. Kai Sang Lock, Past Chairman, Engineering Accreditation Board, IES; Professor, Singapore Institute of Technology (SIT), has visited Bangladesh as Washington Accord Mentor to BAETE and BPERB during 14-21 October 2017. Prof. Lock attended the meeting with the BAETE Chairman & Board members, meeting with the Stakeholders; Observed an accreditation visit at MIST, visited BUET and attended a meeting with Vice Chancellor, BUET and Director, IQAC, BUET and conducted a seminar for Faculty members at BUET; conducted a workshop/training session on preparation for outcomes-based accreditation for Faculty, Program Directors of different public and private universities & also conducted another workshop/sharing session for Program Evaluators of BAETE. He has also attended the meeting with IEB President & Honorary General Secretary; BPERB Chairman, Board members, Stakeholders and Registrar. A 3-member team of Nepal Engineering Council (NEC) namely Mr. Satya Narayan Shah, Chairperson of NEC, Mr. Khem Raj Joshi, Registrar of NEC and Mrs. Kirsteen Merrilees, ICE representative in Nepal visited BAETE on 20 July 2017. Mr. I.A. Khan OBE, ICE representative in Bangladesh also accompanied the team. The NEC team joined a meeting with Prof. Dr. Engr. Jamilur Reza Choudhury, Chairman, BAETE and Prof. Dr. Engr. A.F.M. 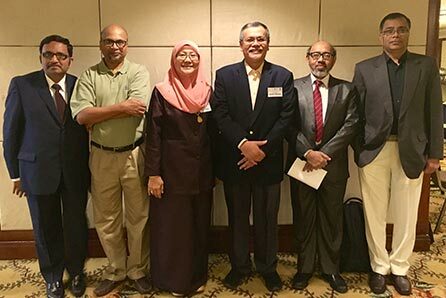 Saiful Amin, Member Secretary, BAETE and exchanged the ideas and views for taking BAETE’s model towards professional recognition in IEA. Engr. Kabir Ahmed Bhuiyan, President, IEB, and Prof. Dr. Engr. 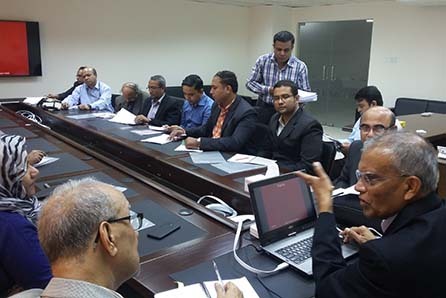 S. M. Nazrul Islam, Chairman, BPERB and Member (Ex-officio) of BAETE Board, also joined the meeting. The same delegation also participated in the EAC Accreditation Decision Meeting (ADM) at Dorsett Grand Subang Hotel, Petaling Jaya, Selangor, Malaysia on 26 July 2017. 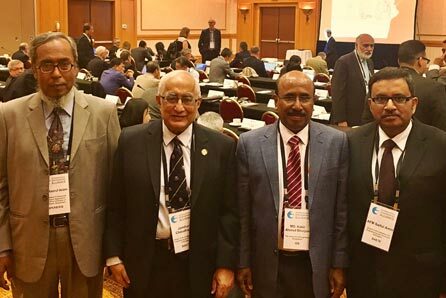 A delegation from BAETE, Bangladesh participated in IEAM 2017 at Alaska, USA during 18-23 June 2017. BAETE was represented by Prof. Dr. Engr. Jamilur Reza Choudhury, Chairman, BAETE and Prof. Dr. Engr. A.F.M. Saiful Amin, Member Secretary, BAETE. In addition, Engr. Kabir Ahmed Bhuiyan, President, IEB, and Prof. Dr. Engr. S. M. Nazrul Islam, Chairman, BPERB and Member (Ex-officio) of BAETE Board, also joined the delegation. 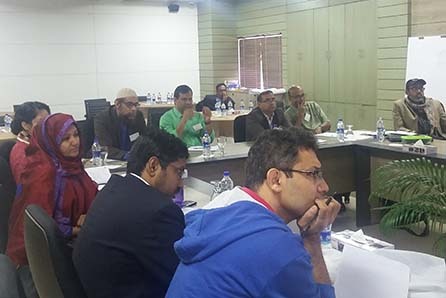 Board of Accreditation for Engineering and Technical Education (BAETE), Bangladesh has enacted a new Manual for Outcome-based Accreditation (OBA) of Undergraduate Engineering Degree Programs. A presentation on this new OBA Manual was held on 18 April 2017 at ERC Conference Room, IEB Headquarters, Ramna, Dhaka-1000. Prof. Dr. Jamilur Reza Choudhury was chair in the program. The VC, Pro-VCs, Deans, Program Heads, Program Evaluators, Members of the Sectoral Committee, Members of the IQAC, Board Members of BAETE & BPERB, Executive Members of IEB, and other Stakeholders attended the program. The new OBA Manual has taken the model documents followed by neighboring countries and other full signatories of Washington Accord (WA) into account. The salient features of the OBA Manual and Outcome Based Education (OBE) was highlighted in the presentation session. The new manual will be effective for considering all accreditation applications received after 30th June 2017. Prof. Dr. Er. 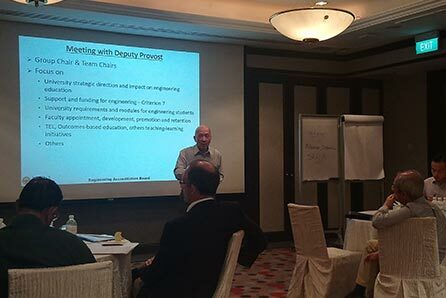 Kai Sang Lock, Institution of Engineers, Singapore (IES) has visited Bangladesh as Washington Accord Mentor to BAETE during 31 December 2016 – 09 January 2017. Prof. Lock attended the meeting with the BAETE Chairman & Board members, meeting with the Taskforce on new draft of OBA manual, meeting with the Stakeholders, visited BUET and conducted training session on preparation for outcomes-based accreditation for Faculty, Program Directors & Evidence-based onsite assessment during accreditation visits for Program Evaluators. He has also attended meeting with IEB President & Honorary General Secretary, BPERB Chairman & Board members and Registrar of BPERB. Prof. Muhammad H. Rashid,Florida Polytechnic University,Lakeland,FL has visited BAETE as Resource person in last December 2016. Prof. Rashid has conducted two Workshops on Engineering Accreditation Issues for the Faculty members and Program Directors on 19&20 December 2016. BAETE organized a Retreat Visit to provide Hands-On-Training for Course Mapping at Program Levelsat BRAC-CDM, Rajendrapur, Gazipur during 08-11 December 2016.Prof Dato' Ir. Dr. Wan Hamidon Wan Badaruzzaman and Prof Ir. Dr. Hjh Siti Hawa Hamzah of BEM have attended as Resource Person/ Trainers. Selected fifteen participants from different programs of different universities have attended in the hands-on training. Prof. Dato' Ir. Dr. Wan Hamidon Wan Badaruzzaman and Prof. Ir. Dr. Hjh Siti Hawa Hamzah of Board of Engineers, Malaysia (BEM) visited Bangladesh as Washington Accord Mentors to BAETE during 29 October – 06 November, 2016. 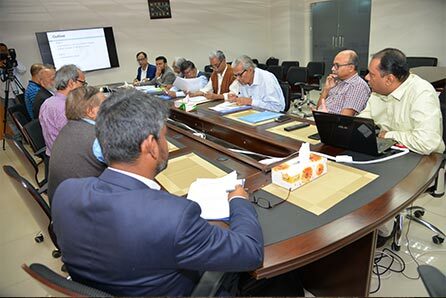 They attended the meeting with the BAETE Chairman & Board members, meeting with the Taskforce on new draft of OBA manual, attended to anAccreditation visit at North South University (NSU) and conducted a Workshop on Outcomes Based Education (OBE) for Faculty and Program Directors of different private and public universities. Er. Prof. Dr. Kai Sang Lock, Washington Accord (WA) Mentor to BAETE & BPERB from IES and Prof. Dato' Ir. Dr. Wan Hamidon Wan Badaruzzaman, Washington Accord (WA) mentor to BAETE from BEM, have visited BAETE, IEB, Bangladesh during 27 April 2018 – 04 May 2018. Prof. 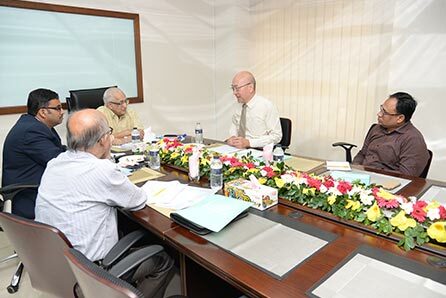 Lock and Prof. Badaruzzaman have attended the meeting with the BAETE Chairman & Vice Chairman and Member Secretary. 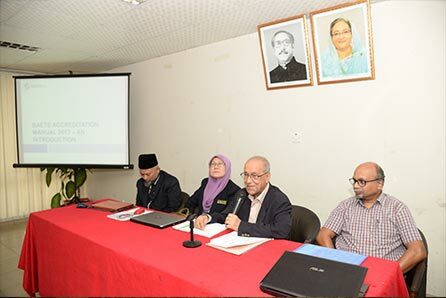 The Mentors have also attended the meeting with the Coordination Committee of BAETE to review the Self-Assessment Reports (SARs) submitted by the Public and Private Universities of Bangladesh for Outcomes-based Accreditation (OBA).The IES and BEM mentors have conducted an Experience Sharing Session with Program Evaluators of BAETE. Members of the Board, Sectoral Committee, Taskforce, Coordination Committee also attended in the Experience Sharing Session. In addition, Prof. Dr. Anisul Haque and Prof. Dr. Salekul Islam have also attended the sharing session as Resource Persons of BAETE. Prof. Lock has also joined the meeting with Hon’ble President, Honorary General Secretary and other Executive Office Bearers of IEB; Chairman & Vice-Chairman of BPERB and Registrar of BAETE & BPERB.